Ellsworth tennis coach Brian Higgins celebrates his 600th victory. Ellsworth tennis coach Brian Higgins talks with his team before their match against Hermon. Higgins celebrates his 600th victory. Brian Higgins admits being a baffled when he learned of his recent selection as the 2017 national high school girls tennis coach of the year. His Ellsworth High School team had finished 10th in Class B North and lost in the preliminary round of the playoffs — a campaign not typically worthy of national accolades. But a little more investigation into the 18th annual award presented by the National High School Coaches Association revealed its true intent: To honor a coach who has amassed more than 600 victories while directing both boys and girls tennis since starting the Ellsworth program in 1981. Higgins is the second coach from Maine to win the NHSCA award for girls tennis, along with Anita Murphy of Lewiston in 2011. “Josh [Frost], my AD, sent me a note that Eric wanted to talk to me about the girls tennis award,” said Higgins. “I knew I didn’t get anything in our league or the state because we were a .500 team this year, although in the past we’ve done pretty well. Higgins holds the distinction of being Maine’s winningest varsity coach for both boys soccer and tennis. He retired from a 42-year career as Ellsworth’s soccer head coach in 2016 with a 566-103-45 record. 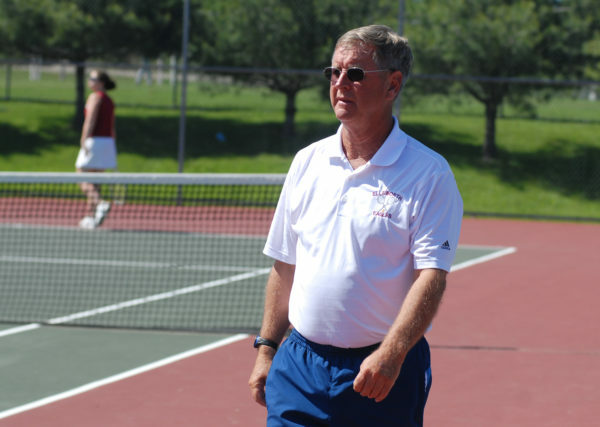 He also owns more than 300 wins apiece with both the Eagles’ boys and girls tennis teams, which have captured a combined 14 regional titles and the 1996 Class B boys state championship. Higgins never played tennis until his college days after serving in Vietnam with the U.S. Navy. 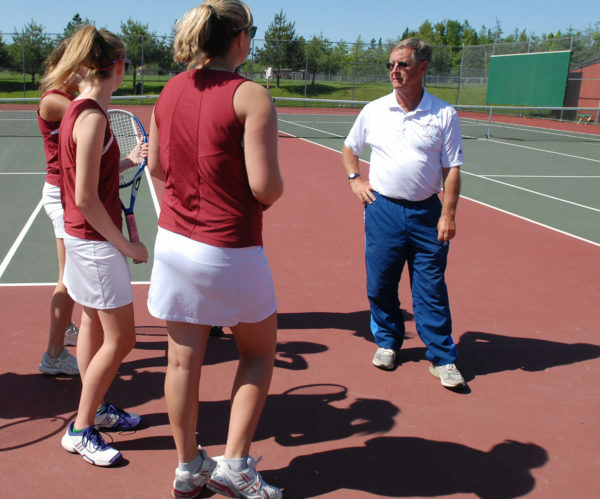 By the time he returned to eastern Maine to teach physical education at Ellsworth High School after graduating from Springfield College in 1974, there were few tennis options in the area. Higgins routinely trekked to the indoor courts in his native Hampden (now Armstrong Tennis Center) to find matches, while at the same time he began teaching the sports to Ellsworth-area youngsters. “We’d go behind the old Woolco, which is now T.J. Maxx, and there would be 10 or 12 or 15 kids and we’d just practice off the wall,” Higgins said. “And when I first came to Ellsworth I had an old Ford station wagon with air shocks in the back and I’d put at least 10 kids in that station wagon and we’d go to Bangor and play indoors once in awhile. Momentum continued to build among the city’s fledgling tennis community, and perhaps with an eye that a high school team was inevitable Higgins got time off from work to attend the 10-day Dennis Van der Meer Tennis Registry Academy in Sweet Briar, Virginia. “That was one of the building blocks, maybe, that they would support a team at the school if I got a little training,” he said. Ellsworth fielded its first boys varsity team in 1981 and Higgins began teaching his players the basics he learned from Van Der Meer — a practice he continues today. The Eagles added a girls team in 1983 and it wasn’t long before Ellsworth was one of the top programs in Eastern Maine. The girls won their first regional crown in 1986 and the boys team achieved its first title in 1988. One of the biggest challenges Higgins’ tennis teams faced during their first 15 years of existence was the lack of home facilities. Originally they practiced and played home matches on private individual courts. “We’d practice at Mr. Willey’s court and at the Grays’ court in Hancock,” Higgins said. “I would go with the doubles teams because you can teach strategy more in doubles than you can with singles, and the singles players would practice on Mr. Willey’s court. Some complaints by opposing teams about those logistics eventually left Ellsworth to play all road matches for several years. At one point a T-shirt was made recognizing the Eagles’ streak of 165 consecutive road matches. That road warrior status finally ended when Ellsworth moved its home matches to a club in Trenton, which continued until three courts were built on the high school campus for use beginning in 1996. That coincided with a boom within Ellsworth’s tennis program, with the boys winning a state title in 1996 and adding back-to-back regional championships in 2001 and 2002. The girls won four straight Eastern B crowns between 1997 and 2000 and another in 2002. The Eagles have remained competitive during the last decade, with the boys team winning additional Eastern Maine championships in 2009, 2011 and 2012 and the girls team edging Hermon 3-2 in an Eastern B quarterfinal on June 1, 2012, to provide Higgins his 600th coaching victory in the sport. While participation continues to be solid, Higgins generally finds young players now arriving at the high school with less of a tennis background than their predecessors. “Other than some kids doing clinics on their own during the winter … I think it’s just a trend, but nowadays we’re not getting kids with any tennis experience before they come to the high school,” he said. “That’s just happened in the last two or three years, it’s dropped right off the table. Higgins, now 72, continues to teach and his players are reaping the benefits. Last spring’s boys squad finished sixth in Class B North and reached the quarterfinals. “Nobody really cares much about tennis except the grandmothers and the parents and the girlfriends,” said Higgins. “There won’t be 150 people at a tennis match like there are at a baseball game.